Let’s start with the sabayon. Anything French is basically gourmet by default. This sabayon, or French custard, came about by mistake. I had intended this to be tarts filled with fruit and topped with whipped coconut cream. But, when my cream wasn’t behaving I was forced to fix it. I heated then refrigerated it and the sabayon was born! Love when that happens! I guess that was confession #1. The list goes on. Confession #2: I tried this recipe with brown rice flour and it came out a bit too crisp. I swapped it out for oat flour and yummy, tender tart shells were the result. Yes, this is a gluten-free goody! The main ingredient and quite frankly the understated star of the show, is the almond…in this case, almond meal. Almonds are a special nut. They are a cousin of stone fruit such as peaches, plums and apricots.¹ Almonds contain cyanidelike substances that are medicinally powerful, so much so they inhibit cancer growth. Its phytosterols contribute to this incredible anti-cancer powerhouse and also reduce cholesterol.¹ Its Vitamin E content and monosaturated fats (holy fats again!) also contribute to reducing LDL cholesterol and improving conditions for the heart. Magnesium, a special mineral that almonds contain, is responsible for clearing the arteries of any calcium build-up.² Your heart is smiling if Mg is present! They also lower the glycemic index of the meal you’re eating. Good news for our blood sugar. Great news for diabetics. One interesting tidbit is that eating almonds with their skins actually makes them work harder than they already do. So, heart is happy, blood sugar is happy, cholesterol is in check, cancer cells won’t even think of setting up shop…I’d say almonds are great addition to everyone’s diet. Good thing I had almonds and not pecans which were the nuts I had intended for this tart…confession #3! They are extremely versatile, too. Enjoy them chopped on salads or sautéed with greens. Have some almond butter on that toast or with crudite. Trail mix and energy bars are other goodies, too. Finally, for the last confession: My husband, not a fruit tart lover at all, confessed that this was one of his favorite desserts yet! Bon Appetit! 1. Pulse the almond meal and flours together in a food processor. Add the ginger, maple syrup and coconut oil and pulse until a dough is formed and you can squeeze it together in your hands. 2. Form the dough into a ball and then pinch off about a T or so to start pressing into the (oiled) tart pan. Press evenly so that all the sides are about the same thickness and it bakes evenly. 4. Preheat the oven to 350°. 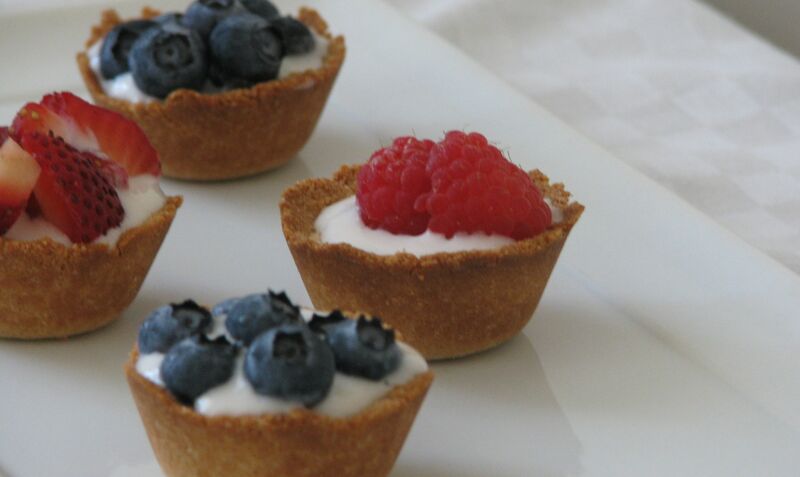 Bake tart shells for about 10 minutes or until the edges are golden brown. Remove from oven and let cool. 1. Add the coconut milk mixture to a saucepan over low-medium heat and bring to an almost simmer (just bubbling at the edges). Stir often to keep it even. Keep it over low heat for 15-20 minutes. 2. Remove from heat and let cool before storing in an airtight container in the fridge. Chill for at least 2 hours before assembling tarts. 1. Measure about a teaspoon of sabayon to fill each tart shell and top with your desired fruit. *Assembled, the tarts will last overnight in an airtight container. Otherwise, the tart shells will last 2-3 days and still be fresh if kept in an airtight container in the fridge. Ditto the sabayon. I usually prefer savory breakfasts over sweet ones. I grew up eating rice and beans as my first meal of the day and it’s still my favorite breakfast. However, once in a while I get the craving for pancakes. Unfortunately I learned the hard way that regular, all purpose white flour pancakes make me angry and irritable immediately after eating them. I know how crazy that sounds and I still chose to share it with you, but I do so only because it’s absolutely true! Gone are the days when I was able to enjoy a good ol’ American breakfast in a diner. I can’t say I miss those days too much because I feel SO good now. Anyway, this craving has resulted in a lot of experimenting. This is the first version of the experiments. 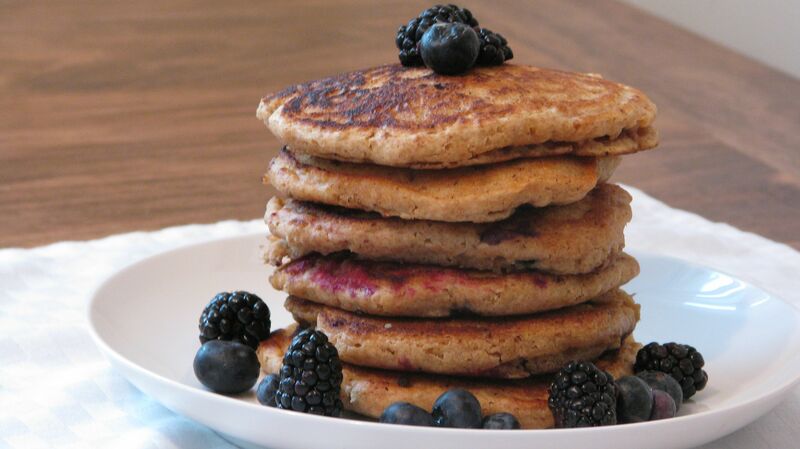 In the coming weeks I’ll post the gluten-free pancakes which are as delish as these are. Spelt is an ancient cousin to wheat. It flourished in the Middle Eastern Mediterranean over 9,000 years ago. It is far less processed that its modern counterparts and offers a wider array of nutrients, too. Spelt’s fiber content helps to reduce overall and the unhealthy LDL cholesterol. As a result, it also offers protection against atherosclerosis. It is also a good source of B12, manganese, copper, niacin and thiamin. “People with a range of health issues, including digestive problems, arthritis, Lyme’s disease, migraines, behavioral issues, skin irritations, irritable bowel syndrome, and others report that they feel better eating spelt rather than common wheat.”¹ Spelt is easier to digest than modern hybrids of wheat. This is because it is water soluble and it breaks down in heat and with mixing. Common wheat is the opposite in that it isn’t water soluble and it gets “stronger” the more you mix. That’s why you knead and knead and knead bread dough, because you’re developing the gluten. Spelt flour is still not suitable for anyone with Celiac or with high sensitivity to gluten. It is however, a great alternative to the ubiquitous wheat. Rivalry runs deep in this family. Just make sure spelt wins most of the battles. 1. In a large bowl, sift together the flours, baking powder, maple sugar and sea salt well. 3. Make a well in the center of flour mixture bowl and gradually pour in milk mixture, whisking gently until incorporated and smooth. 4. Heat a lightly oiled griddle (or frying pan) over medium heat. Pour the batter, in ¼ cup measurements, onto griddle and cook until golden brown on each side. Before flipping pancake over, you’ll see little bubbles form in the batter. When they pop, it’s ready to be flipped over. Please resist the urge to flatten your pancake! 5. Serve hot with maple syrup or jam or fresh fruit. *Whole milk can be substituted for buttermilk (homemade recipe coming soon) or even almond milk. I don’t have a juicer. I know, I know, but my kitchen is small and space is quite limited. So since I don’t have one, I have to find other ways of getting a variety of good greens into my blended smoothies. (I also don’t yet have a vita-mix and since I don’t love chunky bits in my SMOOTHies, it’s sometimes a challenge.) This one however is a home run. The tartness of the berries and the hint of sweetness of the banana play off the slight bitterness of the parsley in a wonderful dance that ends with the pleasantly warm and sweet flavor of the mint. Your tastebuds will be very happy with this one, as will the rest of your beautiful body! The stars of this smoothie for me are the herbs. Parsley is, perhaps surprisingly, such a powerhouse of nutrition! It is special because of its volatile oils. Myristicin is particularly valued for its anti-carcinogenic properties. This oil has been shown to inhibit growth in tumors, particularly in the lungs. Myristicin seems to also help neutralize certain types of carcinogens such as benzopyrene which comes from cigarette smoke and charcoal grill smoke. If that were all parsley did, it would already be super-parsley, but there’s more. Anti-oxidant rich parsley has an abundance of (water-soluble) Vitamin C and (fat soluble) beta-carotene, both of which play key roles in heart health and immune function. It is high in folic acid, a critical B vitamin, and not just for pregnant women either. Finally it’s an anti-inflammatory and a digestive aid. Super-parsley or what? For more info, click here. Mint is also a digestive aid, is an anti-microbial and has its own anti-carcinogenic properties to boast. It has perillyl alcohol which, in animal studies, has been shown to inhibit growth of liver, breast and pancreatic tumors. It’s also a good source of more of those goodies, Vitamin C and beta-carotene. 2. Add banana, flax seeds, coconut oil and vanilla extract and blend until all well incorporated. Lastly, add berries, the rest of the water, lemon juice and ice, if using, and blend thoroughly. 3. Serve with a sprig of mint. 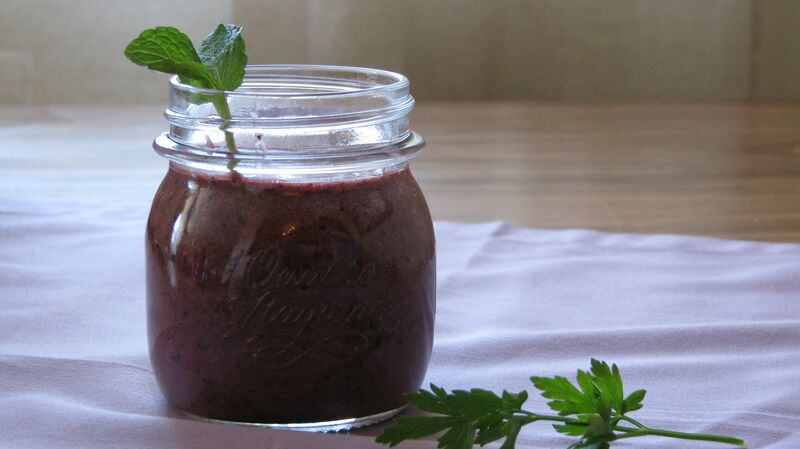 Smoothies look great in small mason jars and add a bit of uniqueness when serving.